Becky Kerr was the recipient of the 2013 Outstanding Service to Environmental Education Award, presented at our conference in November. 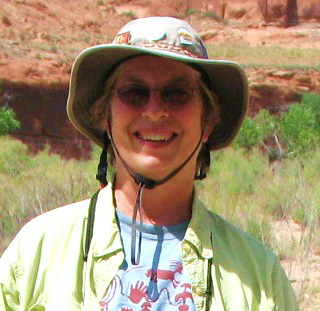 Becky has worked as NM regional coordinator for Four Corners School of Outdoor Education since August 2006. As regional coordinator she trains and works with teachers doing cross-curricular, hands-on, place-based, and outdoor activities. Becky has a B.S. in Microbiology and Medical Technology and a Secondary Science Teaching Certificate. She taught Life Science, Earth Science, and Physical Science to Middle School students for 13 years, and Physics and Sports Medicine to High School students for 1 year. At the middle school she had an educational Environmental Easement, an outdoor classroom. In 1998 she earned the first annual Joan and Hy Rosner Environmental Education award from the New Mexico State Land Office and was given an exemplary teacher award by the New Mexico State School Accreditation team. Becky was on the Board of Directors of EEANM for six years and worked tirelessly to advance environmental education. She has also served as President of the New Mexico Science Teachers Association.